00:00:12.02	00:00:16.09	Welcome to the microscopy lecture series. 00:00:16.10	00:00:17.23	My name is Xiaowei Zhuang. 00:00:22.19	00:00:25.05	Howard Hughes Medical Institute. 00:00:32.22	00:00:36.02	which breaks the diffraction limit. 00:00:39.13	00:00:42.19	to look at cells with much better clarity. 00:00:44.22	00:00:46.18	image of mitochondria. 00:00:49.02	00:00:51.27	super-resolution image of mitochondria. 00:00:53.16	00:00:55.07	that allow us to get there. 00:00:59.14	00:01:02.00	fluorescence microscopy so much. 00:01:07.25	00:01:10.21	for biological research. 00:01:22.12	00:01:23.29	by Bruce Alberts et al. 00:01:33.17	00:01:35.21	highly dynamic all the time. 00:01:37.20	00:01:40.00	actually diving embryonic cells. 00:01:42.26	00:01:44.25	and the green is microtubule. 00:01:58.18	00:02:01.03	with relatively little perturbation. 00:02:14.00	00:02:16.04	as one important advantage. 00:02:19.16	00:02:22.02	and that is you see different color objects. 00:02:35.17	00:02:37.04	quantum dots, you name it. 00:03:05.20	00:03:09.20	allow us to study molecular processes in real time. 00:03:13.11	00:03:16.08	from fluorescence microscopy. 00:03:18.28	00:03:20.19	a quite significant downside. 00:03:20.20	00:03:22.19	And that is its resolution. 00:03:25.13	00:03:28.02	is limited to a few hundred nanometers. 00:03:30.08	00:03:33.15	things inside the cell are much smaller. 00:03:35.26	00:03:37.25	just several nanometers in size. 00:03:43.21	00:03:46.15	with molecules packed in high density. 00:03:53.04	00:03:55.14	that is up to the molecular scale. 00:04:13.28	00:04:17.19	but push the resolution towards the molecular scale. 00:04:20.06	00:04:23.07	this so-called diffraction limited resolution. 00:04:32.25	00:04:34.26	so let me just go through that very briefly. 00:04:36.16	00:04:38.22	all waves are subjective to diffraction. 00:04:45.23	00:04:49.28	the focal spot nonetheless will have a finite size. 00:05:03.13	00:05:05.13	is even approaching 1 um. 00:05:12.04	00:05:14.13	will be broaden by the spot. 00:05:16.03	00:05:17.28	the point spread function. 00:05:25.17	00:05:29.11	none the less we can resolve them. 00:05:44.18	00:05:47.03	are able to resolve them. 00:05:55.24	00:05:58.27	and about 500 nm in the z direction. 00:06:05.25	00:06:07.13	Abbe resolution limit. 00:06:18.16	00:06:22.21	that allow us to break the diffraction limit. 00:06:31.10	00:06:33.01	of the point spread function. 00:06:44.00	00:06:48.09	or its generalized form of RESOLFT microscopy. 00:07:01.15	00:07:04.20	that is substantially beyond the diffraction limit. 00:07:32.26	00:07:35.13	the in short name of, that is, FPALM. 00:07:39.02	00:07:42.14	elaborate both classes of approaches. 00:08:02.01	00:08:04.19	and through bleaching and so on. 00:08:14.28	00:08:19.06	and 3B analysis, as well as other methods. 00:08:34.27	00:08:38.00	and other references so that you could find. 00:08:40.26	00:08:43.12	introduction of STED and RESOLFT. 00:08:51.26	00:08:54.12	break the diffraction limit in the far field. 00:08:57.04	00:09:00.23	he uses two beams to accomplish that goal. 00:09:07.22	00:09:14.01	that induces stimulated emission. 00:09:20.28	00:09:22.21	to a much smaller size. 00:09:30.00	00:09:31.15	beyond the diffraction limit. 00:09:54.06	00:09:58.09	and then give us the sub-diffraction limit image. 00:10:19.01	00:10:20.22	smaller than the diffraction limit. 00:10:35.14	00:10:38.14	and see a much improved resolution. 00:10:42.06	00:10:46.16	living cells, but is also applicable to living animals. 00:10:51.18	00:10:55.29	neurons in the brain of a living mouse. 00:11:03.23	00:11:07.19	I won't further elaborate this approach. 00:11:14.18	00:11:16.23	shrink the point spread function. 00:11:23.03	00:11:26.21	Dave Agard, Rainer Heintzman and co-workers. 00:11:28.28	00:11:35.25	a sinusoidal excitation pattern is applied to the sample. 00:11:50.20	00:11:54.22	into a range that is resolvable by light microscope. 00:12:02.18	00:12:06.03	vertical stripes of excitation pattern. 00:12:11.18	00:12:13.29	that can be detected by the microscope. 00:12:17.26	00:12:20.09	better resolution and diffraction limit. 00:12:31.08	00:12:33.00	beyond the diffraction limit. 00:12:44.16	00:12:47.27	again you see a much higher resolution. 00:12:57.12	00:13:00.25	to take a 3D supper-resolution image. 00:13:13.18	00:13:15.04	much better resolved. 00:13:24.01	00:13:27.26	elaborate on this method further. 00:13:34.29	00:13:38.11	takes advantage of single molecule imaging. 00:14:04.28	00:14:08.09	that we direct take a square root. 00:14:17.25	00:14:20.03	that gives us 2 nm. 00:14:30.16	00:14:33.05	or even higher localization precision. 00:14:37.24	00:14:41.10	to study a variety of biological systems. 00:14:50.24	00:14:54.10	movement of kinesin molecules. 00:15:03.28	00:15:07.19	translate into sub-diffraction limit resolution. 00:15:10.11	00:15:13.16	isolated images of individual molecules. 00:15:23.14	00:15:25.06	conventional imaging approaches. 00:15:32.10	00:15:34.08	of single molecules. 00:15:48.23	00:15:50.06	overlapped with each other. 00:15:55.18	00:15:57.15	localize their centroid position. 00:16:08.23	00:16:11.04	and separate these single molecules images. 00:16:24.18	00:16:26.17	to the fluorescent state by light. 00:16:49.13	00:16:53.19	for those activated fluorophores in this particular frame. 00:17:04.27	00:17:09.14	to build up this superresolution image. 00:17:22.29	00:17:25.17	and the localization density. 00:17:52.06	00:17:54.22	and hence this acronym STORM. 00:18:24.03	00:18:27.01	and he called his approach FPALM. 00:18:45.22	00:18:48.26	that can be applied to many biological systems. 00:18:55.19	00:19:00.01	switching mechanisms and different switchable probes. 00:19:04.14	00:19:07.00	to image microtubules. 00:19:13.21	00:19:18.21	so it give you a smeared poorly resolved image. 00:19:26.28	00:19:30.01	we plot their positions at the right hand side. 00:19:32.14	00:19:36.16	we can see this type of STORM images of microtubules. 00:19:40.27	00:19:45.13	there is a drastic boost of resolution. 00:19:55.26	00:19:57.20	to determine their z position. 00:20:00.15	00:20:03.17	is to use the Astigmatism imaging. 00:20:27.12	00:20:29.18	can determine their x, y position. 00:20:40.05	00:20:42.27	3D superresolution imaging. 00:20:47.21	00:20:49.22	taken that way. 00:21:00.16	00:21:03.03	3D superresolution imaging. 00:21:23.19	00:21:24.06	and other methods. 00:21:37.28	00:21:39.28	that have come out recently. 00:22:13.16	00:22:17.10	in those 3D superresolution, 3D STORM image. 00:22:27.07	00:22:30.09	and 8 nm in z position. 00:22:45.04	00:22:47.23	and 20 nm in z. 00:22:51.25	00:22:54.28	but can also be used for live cell imaging. 00:23:05.08	00:23:07.24	and its cargo transferrin in living cells. 00:23:13.24	00:23:15.24	actually moving towards the pit. 00:23:21.03	00:23:23.19	fission and fusion of mitochondria. 00:23:37.22	00:23:41.19	label mitochondria in living cells. 00:23:45.27	00:23:47.12	the tubular type of structure. 00:24:01.10	00:24:03.20	with 1 kHz type of frame rate. 00:24:03.21	00:24:09.09	So 1000 images to give you one movie. 00:24:14.16	00:24:18.29	it can also be applied to image tissue samples. 00:24:27.19	00:24:30.29	imaged synapses in brain tissue slices. 00:24:41.04	00:24:44.18	and Homer1, a postsynaptic scaffolding protein. 00:24:44.19	00:24:48.21	And here's the STORM image of the same field of view. 00:25:12.02	00:25:14.17	by the synaptic cleft. 00:25:26.25	00:25:30.19	who both will speak in this iMicroscopy lecture series. 00:25:34.28	00:25:37.05	of this approach any further. 00:25:46.06	00:25:50.29	actin cytoskeleton structure in neurons. 00:25:57.11	00:26:00.00	and also in particular in neurons. 00:26:00.01	00:26:04.17	It is important for the polarization of neurons. 00:26:04.18	00:26:09.09	It is important for the stabilization of axons. 00:26:11.21	00:26:13.26	and plasticity of synapses. 00:26:17.29	00:26:20.11	and other functions. 00:26:30.16	00:26:33.26	neurons, but very little is known about that. 00:26:41.18	00:26:43.29	and in dendritic shaft. 00:26:59.20	00:27:01.14	neurofilaments and microtubules. 00:27:10.17	00:27:13.03	and extremely high molecular specificity. 00:27:16.15	00:27:19.17	provides ideal approach to solve this problem. 00:27:23.06	00:27:28.29	STORM image of actin in the dendritic compartment. 00:27:35.10	00:27:37.06	is dendrite specific. 00:27:43.05	00:27:46.23	the longer axis of the dendritic shaft. 00:27:49.15	00:27:51.00	that is not so hard to imagine. 00:27:59.17	00:28:02.16	and we see this drastically different picture. 00:28:17.10	00:28:19.20	to the long axis of the axons. 00:28:19.21	00:28:23.06	And they are arranged in this very regular pattern. 00:28:28.26	00:28:30.07	of the same field of view. 00:28:41.20	00:28:44.27	that wrap around the circumference of the axons. 00:28:44.28	00:28:48.00	As I said, they are highly regular. 00:29:01.27	00:29:05.12	and then see this clearly peaky structures. 00:29:07.03	00:29:09.19	and the secondary and tertiary hormonic and so on. 00:29:15.00	00:29:19.18	corresponds to about 190 nm periodicity. 00:29:31.02	00:29:36.09	which is about 182 nm +- 16 nm. 00:29:45.06	00:29:50.05	what are the factors that are spacing the actin rings. 00:29:54.01	00:29:56.07	actually offered us some clue. 00:30:00.13	00:30:02.05	called spectrin tetramers. 00:30:10.12	00:30:12.16	is known is actually in red blood cells. 00:30:23.16	00:30:27.01	and at the nodes are actually short actin filaments. 00:30:28.29	00:30:32.16	can connect neighboring short actin filaments. 00:30:35.22	00:30:37.29	many metazoan cells. 00:30:38.00	00:30:41.13	And therefore, it is also in the brain. 00:30:45.09	00:30:48.19	has a length of about 195 nm. 00:30:57.03	00:30:58.24	and it's about 190 nm long. 00:31:08.01	00:31:10.29	in analogy to red blood cell. 00:31:13.08	00:31:17.26	again in a analogy to the red blood cell structure. 00:31:22.13	00:31:24.06	the circumference of the axon. 00:31:27.08	00:31:30.23	spaced and connected by spectrin tetramers. 00:31:37.16	00:31:39.01	together with actin. 00:32:01.28	00:32:04.07	C terminal domains. 00:32:07.20	00:32:09.14	which is indeed also what we see. 00:32:13.20	00:32:17.17	and adducin form those alternating patterns. 00:32:37.00	00:32:40.17	periodic, ladder-like pattern. 00:32:40.18	00:32:43.21	And this sample is stained for Beta-II spectrin. 00:32:47.05	00:32:49.27	we can also see it in brain tissue slices. 00:32:55.20	00:32:57.06	the periodic-like pattern. 00:33:06.27	00:33:08.12	was previously unknown. 00:33:11.25	00:33:14.08	periodically arranged actin rings. 00:33:23.02	00:33:26.07	connected by spectrin tetramers. 00:33:37.04	00:33:39.26	plays some important roles for neurons. 00:33:53.12	00:33:58.22	a thin and long axon filament needs. 00:34:07.05	00:34:09.05	also in a periodic pattern. 00:34:28.12	00:34:33.28	be important, novel structure for neurons. 00:34:43.18	00:34:47.27	function of this cytoskeleton structure. 00:35:12.11	00:35:15.10	lead to new biological discoveries. 00:35:22.20	00:35:26.10	and discoveries that keep coming out. 00:35:41.26	00:35:45.10	and in this same microscopy lecture series. 00:35:55.17	00:35:59.19	to the studies I discussed in this lecture. 00:36:07.21	00:36:10.27	Bo Huang, Mark Bates, and Mike Rust. 00:36:28.24	00:36:34.28	is due to Ke Xu and Hazen Babcock. 00:36:42.05	00:36:48.07	in neurons is done by Ke Xu and Guisheng Zhong. 00:36:55.12	00:36:58.06	for their generous support. 00:37:05.27	00:37:07.27	advanced microscopy approaches. 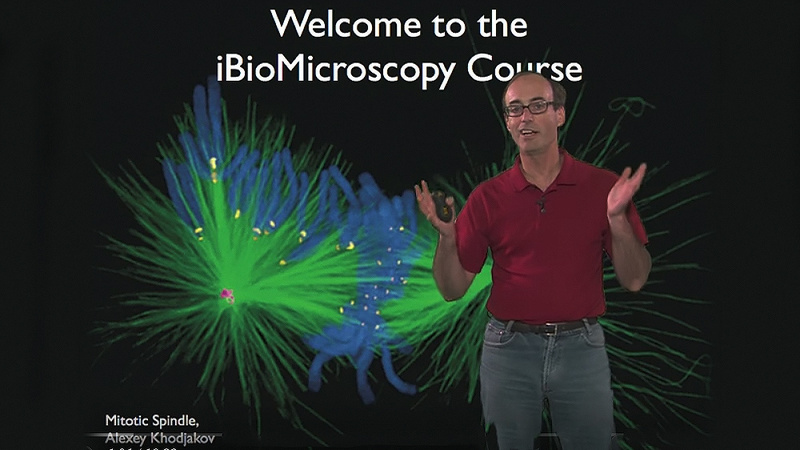 This lecture surveys a variety of recent methods that achieve higher resolution than is possible with conventional microscopy with diffraction-limited optics. These include different types of patterned illumination (e.g. STED and SIM microscopy) or techniques that build up an image by stochastically switching on single fluorescent molecules and localizing each molecule with high spatial precision (STORM, PALM, FPALM). What is the precision at which one could localize the position of single fluorescent dye molecule if 10,000 photons are collected and the width of the diffraction limited spots is 250 nm? ii. High precision localization of well separated single, photoactivatable GFP molecules, which through iterations of photoactivation can build up an image. iii. Uses a second donut shaped illumination beam to deplete fluorescence and reduce the point spread function. iv. High precision localization of photoswitchable organic fluorophores which can be activated/deactived by light. STORM/PALM or SIM: which technique typically has faster temporal resolution? STORM/PALM or SIM: which technique typically has better spatial resolution?